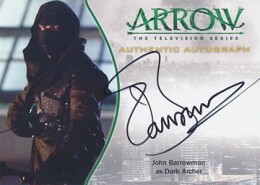 The 2015 Cryptozoic Arrow Season 1 Autographs checklist has no shortage of signatures. 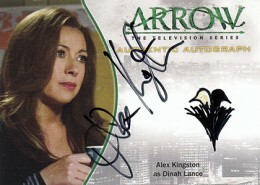 All told, there are 23 different cards from 21 signers. Inserted one per box, building a set isn't easy. Factor in a handful of short prints and things get even tougher. 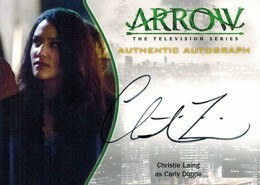 Top Cryptozoic Arrow Season 1 signers include (Katie Cassidy (Laurel Lance), Willa Holland (Thea Queen) and Emily Bett Rickards (Felicity Smoak). 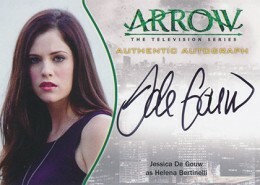 Both John Barrowman and Jessica De Gouw have two different cards. 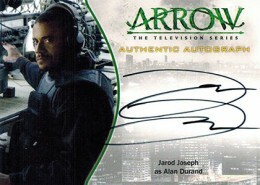 One is for their civilian lives while the other puts them in their characters' costumes. 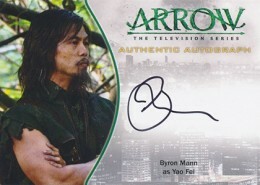 Even with all the ink in the set, some are going to instantly notice who's not in the set. 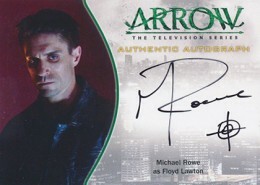 Arrow's lead star and titular hero, Stephen Amell, was originally slated to have autographs in the set. 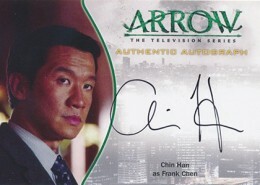 Although he agreed, the cards never came to be. 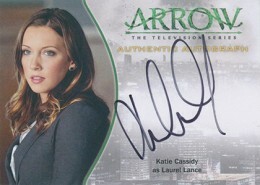 For those doubting the legitimacy of Katie Cassidy's autographs due to a rubber stamping incident with Cryptozoic's Supernatural set, there's no need to. 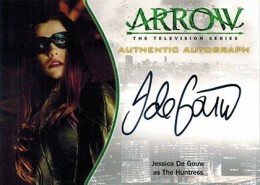 Her Arrow cards that made it into packs were signed at the same time that her Supernatural replacements were. 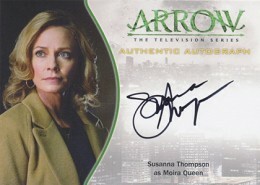 Cryptozoic has confirmed that not all the Arrow Season 1 Autographs are available in equal quantities. 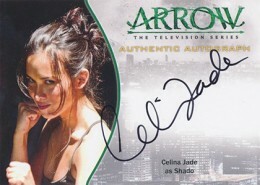 Most have between 250 and 300 copies. 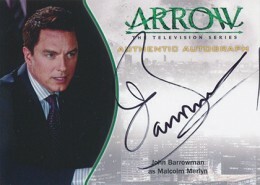 Barrowman and De Gouw signed approximately 450 total, but that's split roughly evenly between each of their two cards. 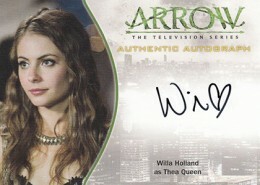 This would put each of their cards in the 225 to 250 range. 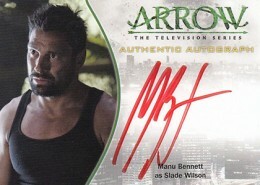 Manu Bennett signed about 380 cards. Some are in black ink and some are in red ink. 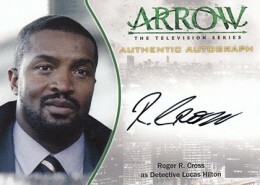 Black ink versions are more common. 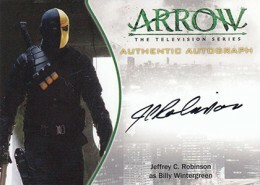 The set also has a handful of short prints. 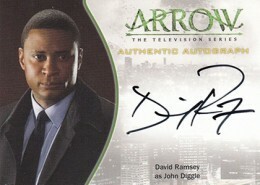 Katie Cassidy, David Ramsey, Willa Holland, Susana Thompson, Paul Blackthorn and Emily Bett Rickards each signed around 100 cards each. 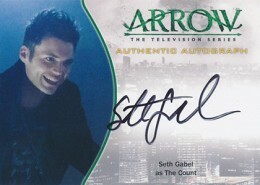 Below is a full visual guide to all of the 2015 Cryptozoic Arrow Season 1 Autographs. 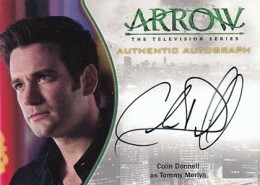 Looking for a particular card or want to track current market values? 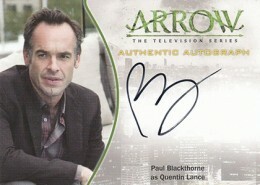 Click on the links or images to shop for cards on eBay.